When most people think about lasers, they usually imagine them generating heat and even setting something on fire. But, for a group of scientists in The University of New Mexico's Department of Physics & Astronomy, lasers are actually being used to reach temperatures colder than the arctic circle. Dr. Mansoor Sheik-Bahae, professor of physics and astronomy, along with his research group, are advancing a technique called optical refrigeration to reach cryogenic temperature. 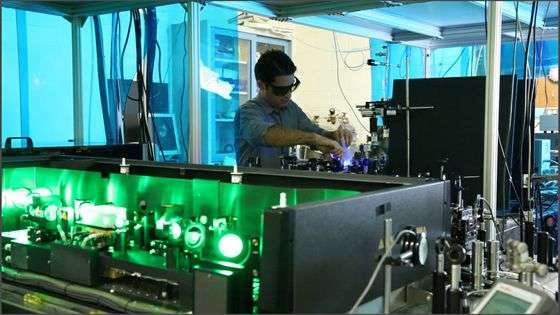 Essentially, the group is using laser light to chill a special type of crystal, which can then be attached to a device that requires constant and reliable cooling, like infrared detectors on satellites. What sets their technique apart is the temperatures it can cool to without having any moving parts. "Right now, anything that cools other parts of a system has moving parts. Most of the time, there's liquid running through it that adds vibrations which can impact the precision or resolution of the device," explained Aram Gragossian, a research assistant in Sheik-Bahae's lab. "But, when you have optical refrigeration, you can go to low temperatures without any vibrations and without any moving parts, making it convenient for a lot of applications." Earlier this year, Sheik-Bahae, along with collaborators at UNM, and Los Alamos National Labs, reached the lowest temperatures ever recorded using an all-solid-state cryocooler – 91 kelvin or -296o Fahrenheit – temperatures that were previously only able to be reached using liquid nitrogen or helium. The research, Solid-state optical refrigeration to sub-100 Kelvin regime, was published in Scientific Reports. "Here at UNM, we are the only group in the world that's been able to cool to cryogenic temperatures with an all-solid-state optical cryocooler," said Alexander Albrecht, one of the paper's co-authors and research assistant professor at UNM. "We are really on the cutting edge when it comes to solid-state laser cooling," said Sheik-Bahae. "While achieving major milestones in the fundamental science aspect of this field, in parallel, we are making rapid advances in implementing this technology for real world applications. 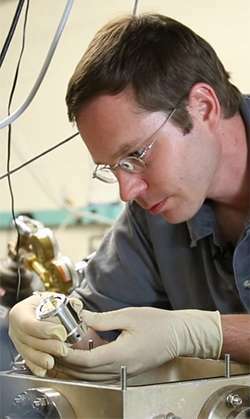 For example, in partnership with a NM startup (founded by one of pioneers on the field, Richard Epstein), we are developing the world's first all-solid-state cryocooler device"
This latest achievement is the product of more than 20 years of work by researchers at UNM, the University of Pisa in Italy and New Mexico's national laboratories. In 1995, researchers at Los Alamos accomplished cooling of about one degree. 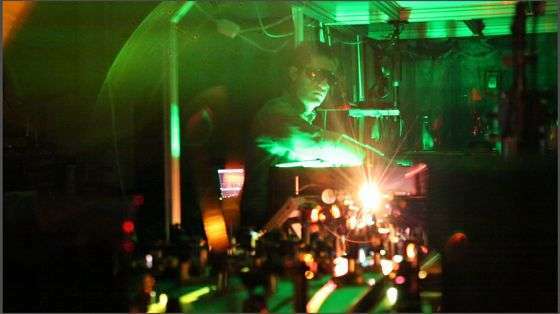 Since then, through vast improvements in the purity of synthetic crystals containing Ytterbium ions and the lasers being shot at them, UNM scientists have been able to continue cooling to colder and colder temperatures. "We were able to identify what kinds of crystals can be used for this. And, in collaboration with Los Alamos National Labs and a few other universities, we finally found crystals that can cool to these extreme temperatures," said Gragossian. Moving forward, Sheik-Bahae and his team hope to continue working on the cutting edge of this technology to achieve even colder temperatures; something they believe will have a major impact in a variety of industries and applications. One function of solid-state cryocoolers is to cool infrared focal plane arrays (cameras), which can be used for a variety of applications and are even being utilized to detect skin cancer in patients. The detectors must be able to read miniscule changes between healthy areas of skin and diseased areas, so having a cooling system that does not generate vibrations could be extremely useful. 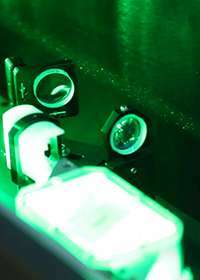 Another application that is being currently developed in collaboration with the scientists at the National Institute of Standards and Technology (NIST) in Colorado is cooling of delicate "reference cavities" for achieving super-stable lasers that will be used as high precision clocks in myriad of metrology applications. While these examples are just a few of the potential uses for solid-state cryocoolers, the opportunities are endless and could change the way cooling devices are utilized around the world. As part of UNM's Department of Physics & Astronomy, Sheik-Bahae and his team will be part of the new Physics, Astronomy & Interdisciplinary Science (PAIS) facility slated to be built on campus. PAIS, a new state-of-the-art high-research center, will be constructed at the site of an existing City of Albuquerque water reservoir, just north of Central Ave. between Yale Blvd. and Cornell Dr. The 137,000 sq. foot facility will have research labs, classrooms, office space and modern infrastructure to support projects being done by Sheik-Bahae and a variety of other scientists from several different disciplines across campus. "The building that our labs are currently in is from the 1950s and that severely limits our ability to do research," explained Albrecht. "There are just not enough utilities available in this facility to meet our needs." As researchers working in optics and photonics, the lab space is an extremely important part in the success of daily experiments. "These are experiments that nobody else can do anywhere else in the world," said Gragossian. "We truly are pushing the limits of science with our work and we need the best conditions possible to do that in." Things like changes in the labs temperature or too much dust can cause big problems for researchers, according to Gragossian and Albrecht. If the optics equipment has dust particles on it, for example, the laser can damage those mirrors in a fraction of a second. Right now, researchers are forced to take additional measures to ensure the optics tables have as little dust on them as possible. They must use plastic panels to keep the equipment contained and pump filtered air onto the table to push any remaining dust away. "In a normal lab, that is built for such experiments, you wouldn't be required to take these extreme measures," said Gragossian. "But, that is what we have to deal with in our current facility." PAIS, which will cost more than $65-million, will be the largest building on main campus. Right now, a portion of the money needed for the facility would come from bonds, with New Mexicans slated to vote on a General Obligation Bond C package this November. If Bond C is approved, the facility could be completed by 2019. Along with funding projects on UNM's main and branch campuses, Bond C will also provide millions of dollars for higher education institutions across the state, all without raising taxes. Additionally, the investment by voters will have a big impact on the state's economy and is projected to create more than 1,300 new jobs – a huge boom to families across the state and researchers at the University. "With Bond C, we'd be able to push our work even further and continue to be the leader in optical refrigeration and many other fundamental research projects that we do here at UNM," Gragossian said. 0 Kelvin is the coldest temperature possible by definition. I stumbled over that too, until I realized they were saying 91 kelvin preceded by an emdash, not a minus.